Find and Recruit Top Talent Outside of Canada | Mentor Works Ltd. Attracting and retaining skilled labour is an increasingly difficult challenge that many Canadian businesses must overcome. There are many valuable and skilled international workers who could well suit a Canadian organization and workforce, and many Canadian businesses seek out foreign workers to help fill labour needs when there are no Canadian citizens or permanent residents available to fill positions. These individuals can arrive in Canada through a range of positions such as a temporary worker, intern, permanent worker, or an international student. Bringing in skilled foreign talent is a great way to reinforce the strength of your workforce. While businesses are in the process of actively seeking foreign employees, it is imperative that all the correct steps are taken to find and successfully bring an individual to Canada for employment. This article provides information on some of the most-used programs the Government of Canada offers to help employers in the hiring process. Please note: There may be additional programs available to hire foreign workers not noted in this article and the complexity of the process will vary on a case by case basis. After exhausting the domestic candidate pool, businesses often look to international skilled workers as a source of talent. There are many government resources and programs employers can turn to in order to effectively find and bring skilled foreign workers to Canada to fill vacant positions. Employers in Canada can hire Express Entry contenders to meet labour needs if they are not able to be fulfilled by Canadians or permanent residents. This program allows employers to have direct involvement in hiring pre-screened skilled foreign workers to meet the desired needs of their business. According to the National Occupation Classification, a skilled worker means Skill Type 0, Skill Type A, or Skill Type B; see below. Canadian Experience Class: The Canadian Experience Class is for skilled workers who have Canadian work experience and who desire to become permanent residents. Federal Skilled Worker: The Federal Skilled Worker Program is for skilled workers with foreign work experience who wish to immigrate to Canada permanently. Federal Skilled Trades Program: The Federal Skilled Trades Program is for skilled workers who want to become permanent residents based on their qualifications in a skilled trade. Many provinces and territories have nominee programs where the government nominates individuals who are seeking to immigrate to Canada for work and reside in the nominating province or territory. Some programs have the intention to attract foreign investors and entrepreneurs from around the world, while others help to fill labour gaps that businesses may be facing. International Mobility Program: This program is designed to advance Canada’s economic and cultural national interest on a global level. Employers can hire foreign nationals without needing a Labour Market Impact Assessment (LMIA). Temporary Foreign Worker Program: This program allows employers in Canada to hire foreign individuals to fill positions for which qualified Canadians are not available. Employers must also obtain a Labour Market Impact Assessment (LMIA). The Global Talent Stream provides a two-week standard for the processing of work permit applications for specialized and skilled temporary foreign workers. There are two categories eligible emloyers may apply under. Category A: This stream is for high-growth, innovative firms in Canada that demonstrate a need to recruit foreign workers with a unique talent. Employers must be referred to the Global Talent Stream by a designated referral partner. Category B: The Global Talent Stream is is also intended for Canadian employers looking to hire certain highly skilled foreign workers for occupations found on the Global Talent Occupations List. For more information on the Global Talent Stream and the Global Talent Occupations List, please visit the Government of Canada’s Global Talent Stream webpage. A Labour Market Impact Assessment (LMIA) is a document that an employer in Canada may need to obtain before issuing a Temporary Work Permit. Supplied by Employment and Social Development Canada, the document gives the employer permission to hire a temporary foreign worker. A positive LMIA will show that there is a need for a foreign worker to fill a position and that no Canadian worker is available to do the job. A positive LMIA is sometimes called a confirmation letter. Find out if you need a Labour Market Impact Assessment. Collège Boréal: Collège Boréal offers a wide range of educational selections and programs for francophones to encourage the integration of new francophones in Canada. ACCES Employment: ACCES Employment assists job seekers from diverse backgrounds to find employment and integrate into the Canadian job market. Humber College: Through their five employment service locations, Humber provides an array of employment services and training programs to support all job seekers in the community. Job Skills: Job Skills is a non-profit community-based employment training agency that offers newcomer, employment, and business and employer services including individual skills development for the workplace. COSTI Immigrant Services: COSTI Immigrant Services is a community-based multicultural agency providing educational, employment, settlement, and social services to all new Canadians, immigrant communities, and individuals in need of assistance. JVS Toronto: JVS Toronto provides mentoring, innovative employment programs, and pre-arrival services to help internationally trained professionals integrate into the Canadian job market. JobStart: Since 1980, JobStart has been a community based, non-profit agency that connects GTA job seekers and employers. Skills for Change: Skills for Change is known for delivering programs that respond to shifting immigration and workplace trends and that lead to employment. Seneca: Seneca offers many programs for newcomers to Canada that assist with job search, job placement, career planning, language instruction, and culture in the workplace. WoodGreen: A founding United Way member agency, WoodGreen creates opportunities for more than 37,000 individuals and families each year through its hundreds of staff, partners organizations, and volunteers. The Professional Immigrant Networks is a collection of partner organizations and professional associations who support the development of immigrant professionals in their careers in Canada. PINs connects employers with immigrant communities and provides ways to communicate and promote their business. Associations in the network are led by immigrants and serve a wide range of professions and communities. Search the PINs directory to find professional associations supporting immigrants in the Greater Toronto Area (GTA). Aside from hiring international workers, Canadian businesses have several domestic hiring and training options. Proactive businesses can receive Canadian government grants and loans to hire youth graduates or train members of their existing workforce to build new skillsets. Mentor Works has developed educational and planning resources to help businesses understand the options available. Canadian Small Business Funding Guide: The Canadian Small Business Funding Guide will help businesses to prioritize strategic projects and find grants and loans to extend cash flow for hiring and training needs. Wage Subsidy Identifier™: Fill out Mentor Works’ Wage Subsidy Identifier™ contact form to tell us more about the types of hires you’re planning to take on. We can then recommend a plan to optimize your use of government funding programs. 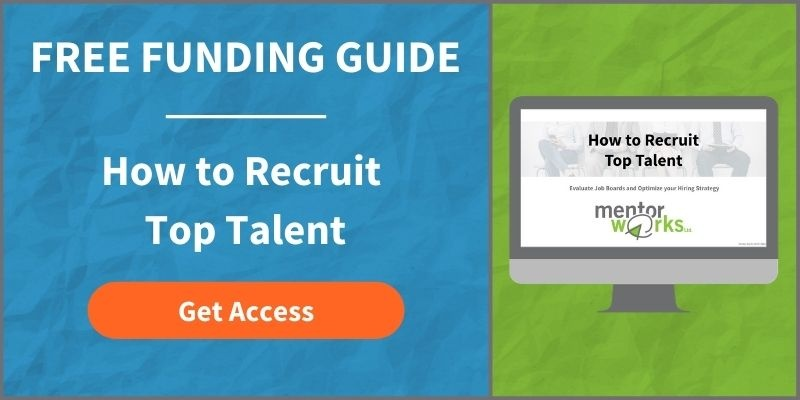 How to Find and Recruit Top Talent: In this slide deck, managers can compare top Canadian job boards and learn how Canadian government grants can be used to offset the costs of your new hire.